Use the butter to grease a shallow ovenproof baking dish and a sheet of greaseproof paper. Set the oven at 190°C(375°F) gas 5. Spread out the onion rings on the base of the dish and top with the sliced tomatoes. Lay the fish on top of the vegetables and pour the wine over. Sprinkle with salt, pepper and tarragon. 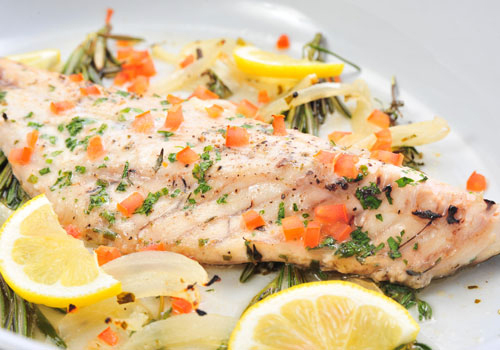 Arrange the lemon slices on top of the fish and cover loosely with the buttered greaseproof paper. Bake for 30 minutes. Garnish with sippets and serve from the dish.